Vada's Blog Stamp Inks and Paper : It’s the most Wonderful Time of the year. Fashionable Stamping Challenge is I’m Dreaming Of A White Christmas Challenge #9 . 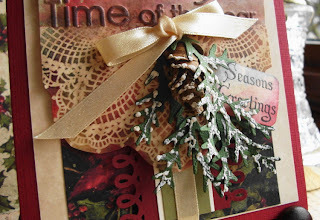 I’m also linking my card to Our Creative Corner Challenge which is “O Christmas Tree Challenge“. This card contains two stamps, one embossing folder and one punch. 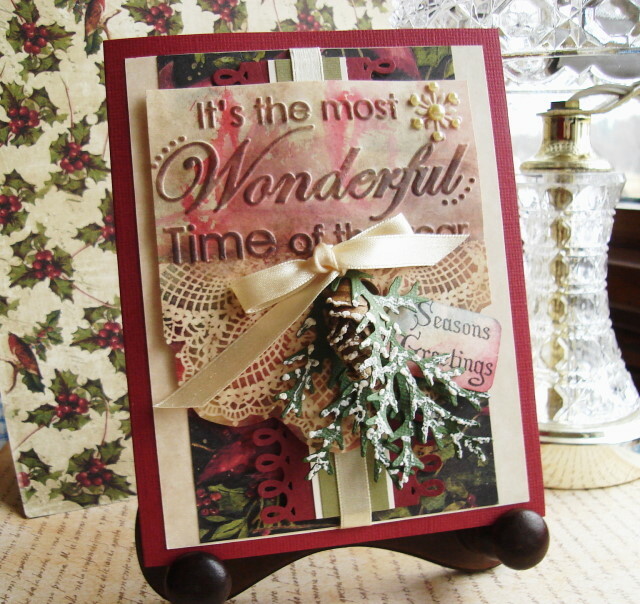 Stamp credits are, Lacy Doily from Stampin’ Up and Seasons Greetings from Crafty Secrets. Embossing Folder is Sizzix and Punch is from Martha Stewart. 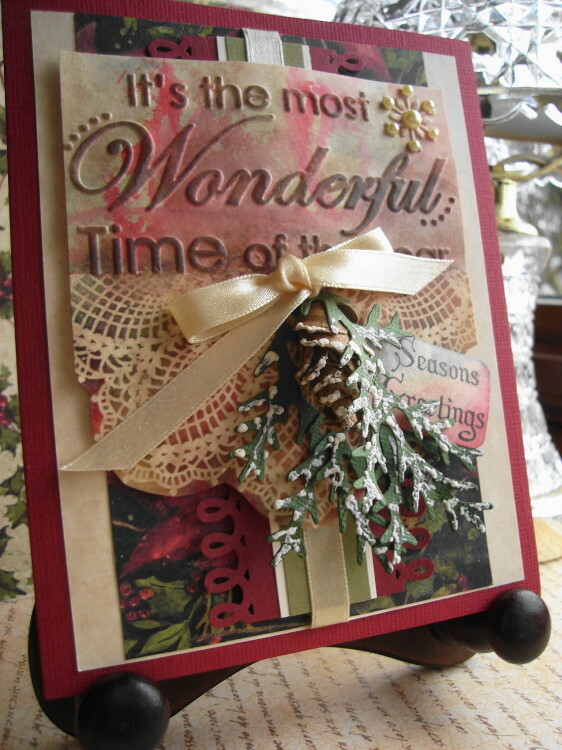 Plus Tim Holtz “Tattered Pinecone Die”, (I Love It). I added some Liquid Appliqué and Glitter Pen to the pine bows and pinecone. Hope everyone had a wonderful Thanksgiving, and got in some shopping. Wow, Vada, this is so beautiful, with so many wonderful details! Love the doily, the pinecone, the fab little pearl accents on the snowflake... everything! This is absolutely gorgeous! Love everything about it! I too have that doily stamp! My mom crocheted doilies by the bucket load! She had this pattern. I believe it's the pineapple pattern. Great techniques and design Vada! So beautifully detailed! Love all the layers, which you have such a talent for doing! Hope you had a wonderful Thanksgiving trip and feast! Hugs! A wonderful Christmas card with great elements. Thanks for joining us at Fashionable Stamping Challenges this fortnight. What a lovely Christmas card ... I love the festive colours you have used too! Vada, your card is smashing! I love the way you ran the dark red edging up the center instead of on an edge. Fantastic idea. And the embossing plate is new to me... what a beauty. Thanks so much for joining us this week at Our Creative Corner! Vada, This card is spectacular. Love everything about it. It would be fabulous as a wall hanging. This couldn't be anymore special. WOW. Gorgeous colours and it all exudes a sense of the nostalgic which I love. A really beautiful and interesting card! A really beautiful card Vada. Love the doily and your embellishments are gorgeous. Thanks so much for joining in with our FSC challenge and lovely to see you again.